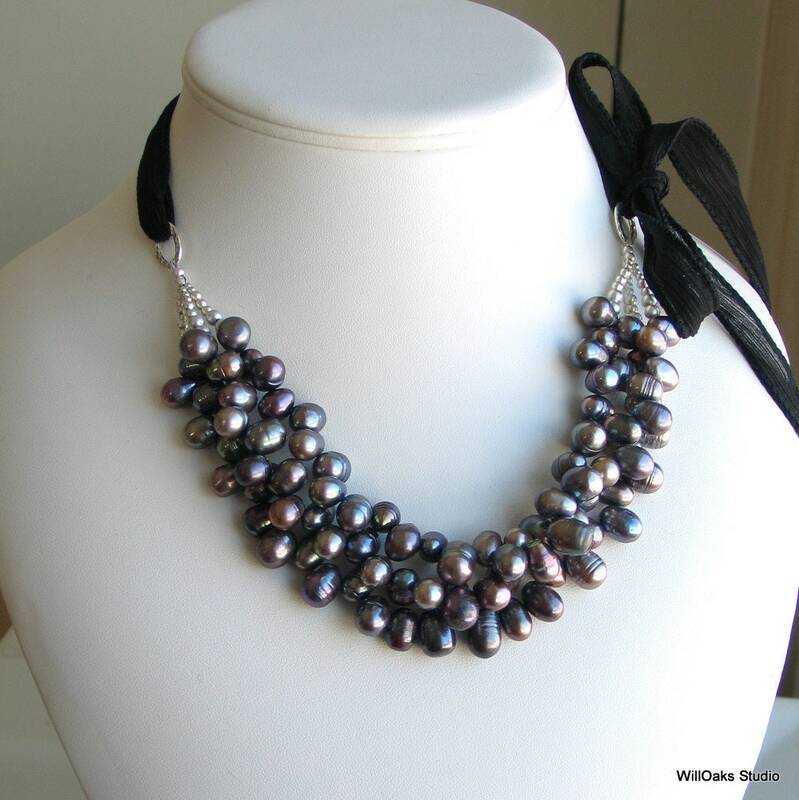 Dark peacock pearls create a thick, rich cluster becoming a stunning, original statement bib necklace. A handmade silk ribbon adjusts the bib to just the right length and look for you. 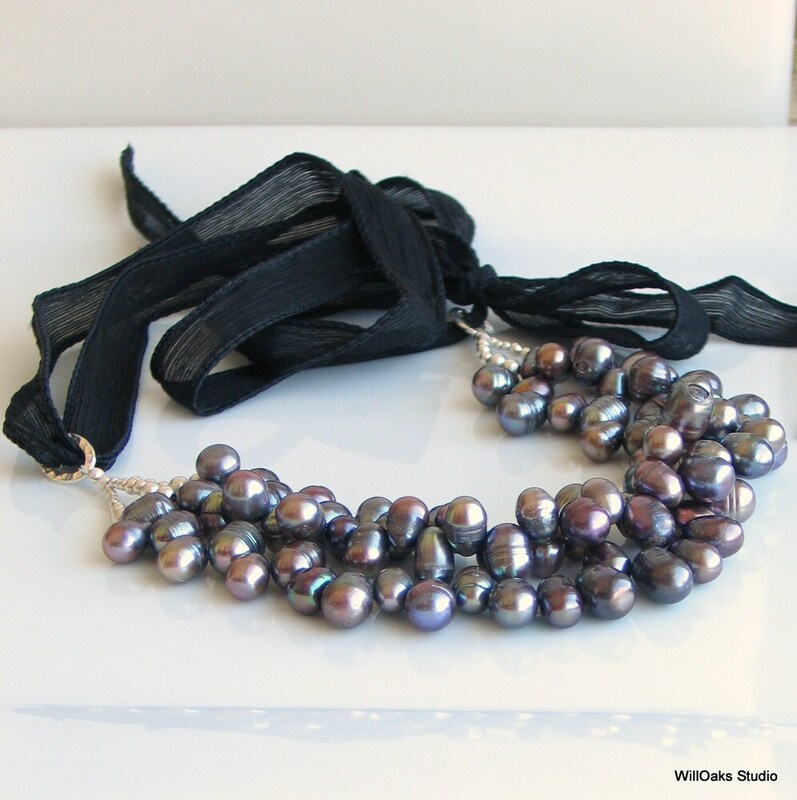 A dense cluster of dark pearls is bracketed with graduated satin finished sterling beads and connected to oval rings. The textured, silver plated rings are threaded with a black, artist dyed and sewn silk ribbon to adjust to the wearing length of choice. 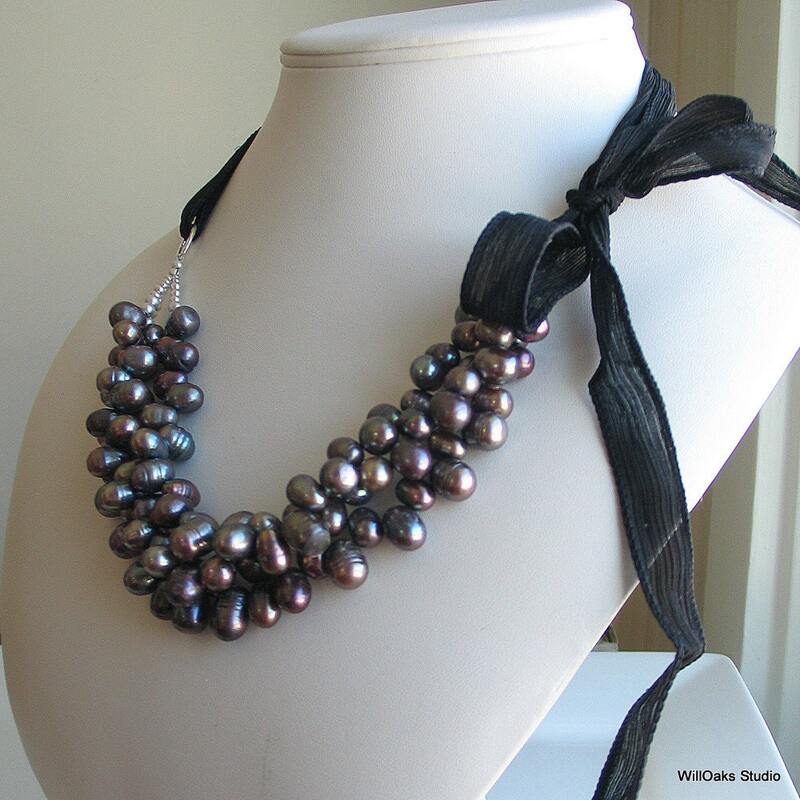 An artisan original design, this deluxe pearl fashion piece is an original accessory and would be fabulous gift for the woman in your life! 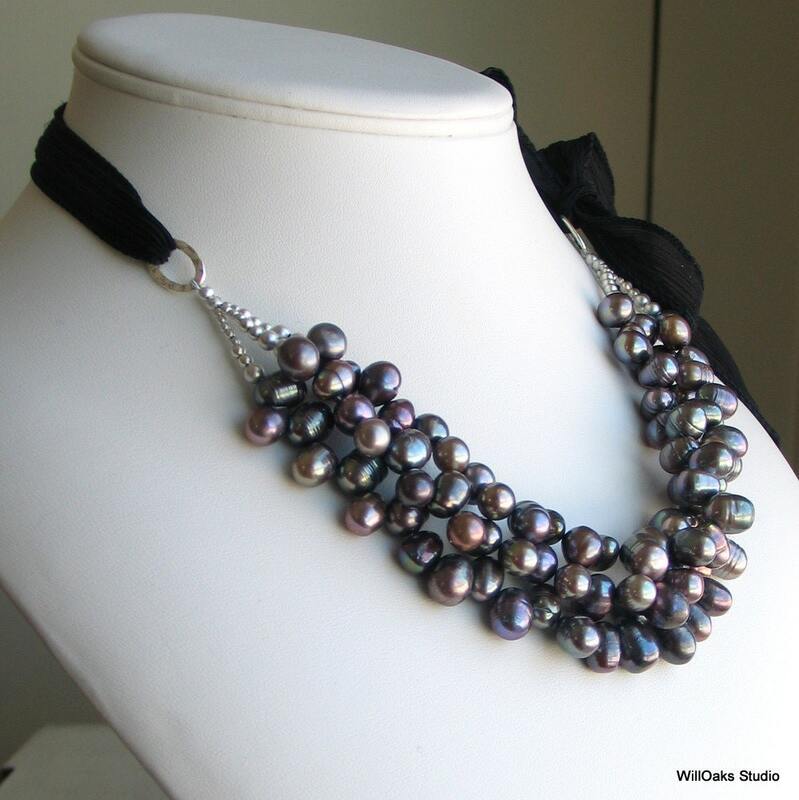 The pearl focal point measures just under 10" long including the rings, and drops just under 1" in the front. 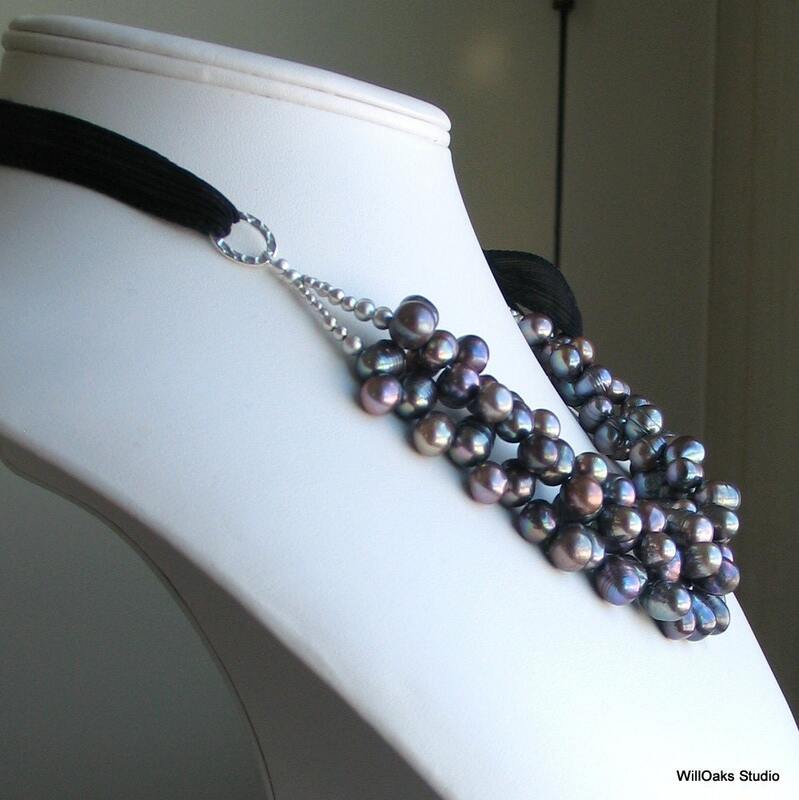 The dark dyed freshwater pearls are each about 6 mm to 10 mm, with a subtle but colorful peacock finish, great luster-a perfect accessory to smarten many different outfits. And with the adjustable length, this bib will complement many different necklines, cross seasons and go from the board room to the board walk. Love it-- looks great and will go with everything. Thank you! Karen, These gorgeous necklaces are amazing !!!! Can't believe you made them when you were incapicitated! They are stunning !!!! Thanks so so very much !!!! Perfect. Exactly as pictured. Much nicer when viewed in person as well. I received so many compliments on this piece. Thank you so much! It's beautiful! Beautiful design! Thank you, Karen.